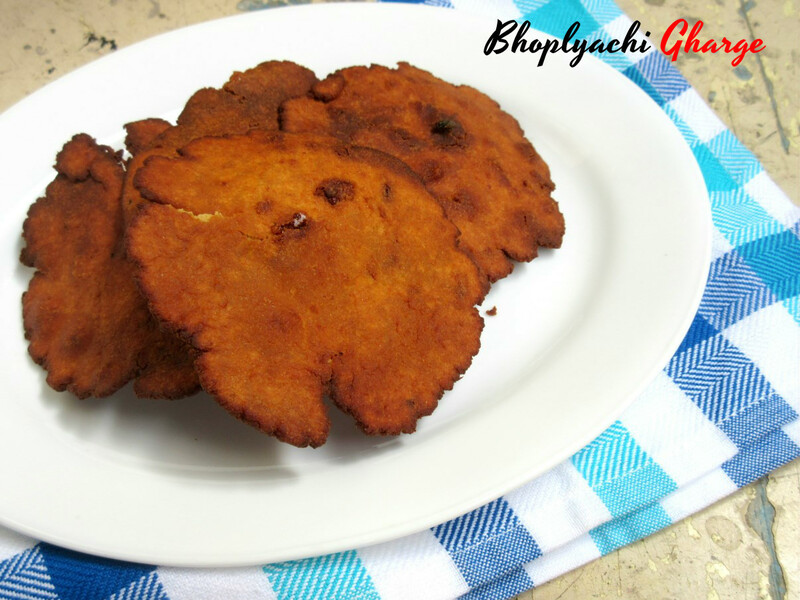 For Indian Cooking Challenge, we are going to make a Maharashtrain Special Bhoplyache Gharge, suggested by Pradnya. She says her maternal grandmother used to make for them every year and pack to them from their village. These stay good for 10 – 15 days easily. And very popular dish for rainy season. I have been planning on making this since the last four days and yet this simple dish never got done on time. I made it for breakfast the previous day and as expected the recipe is simple and easy to make. It doesn’t even require much planning. Just proper kneading and ensuring you deep fry it well. I made with just 3/4 cup of grated red pumpkin, I used about 1/2 cup of powdered jaggary and almost about 3/4 cup of wheat flour. I got about 5 -6 pooris. I know I could’ve added little more flour and kneaded it for some more time, if you notice the fried pooris. With nobody eating anything like this, I know this number will be enough for Konda. I was hoping on what Pradnya said on storing this for a week. 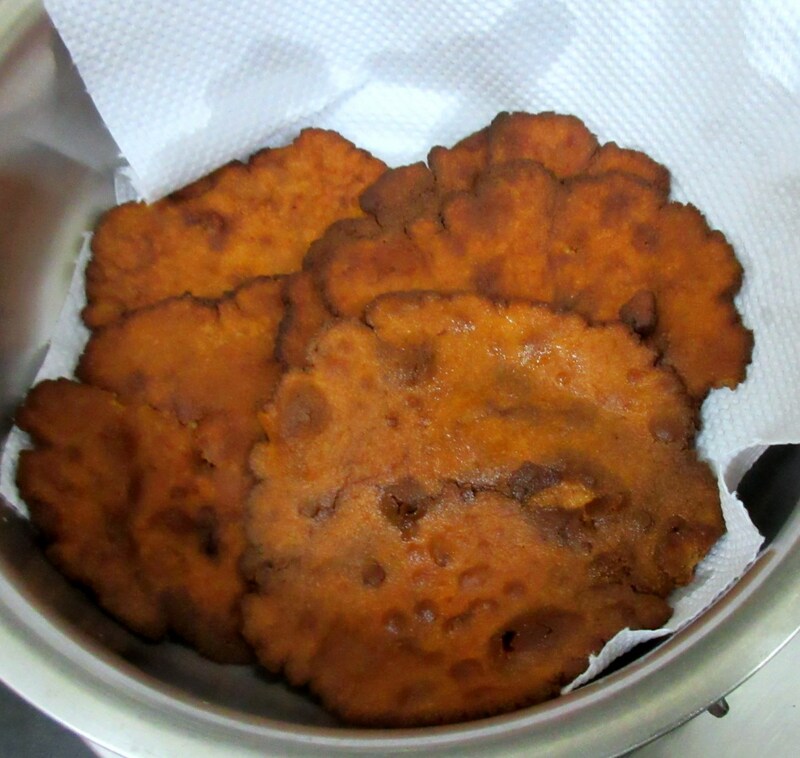 After I made it, I realized that it tastes much like our Athirasam, only so much easier to make. While you are deep frying it will look soggy, it becomes crispy within minutes of cooling down. 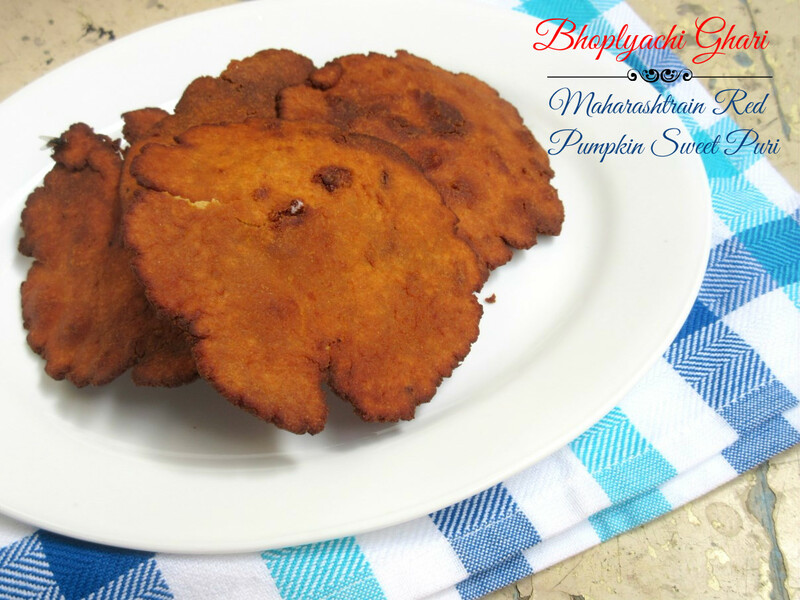 Amma makes Gummadikaya Gojju with Red pumpkin, recently we made a sambar as well. So knowing another delicious recipe with this vegetable is awesome!. I will surely make this again, knowing how simple it is. Please make sure you read the notes. I am giving her original recipe below. Wash and grate the pumpkin. In a non stick pan, take the pumpkin and cook till its nicely cooked. then add grated jaggary and continue stirring till the mixture comes together nice and thick. Let it stand for 5 mins, add the cardamom powder and salt, then add the wheat flour to the mix and start mixing and slowly add the flour as well, till you get a soft dough. Do not add water, only use the mixture and use flour as much as required. 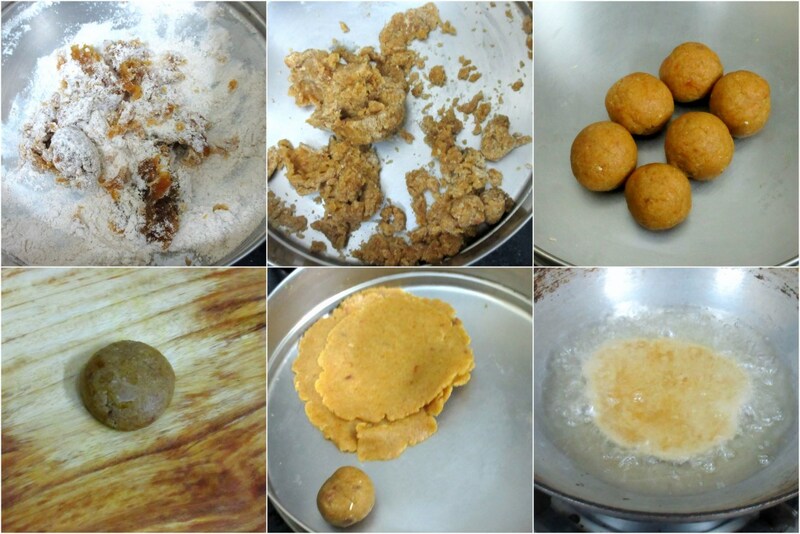 Now make small balls of the dough and roll them out flat, like a poori. Heat oil in a kadai and when hot, reduce to medium flame and deep fry each poori on both sides. Remove with a slotted ladle on to a kitchen towel and let it cool down. Please do not cook the jaggery and pumpkin mixture too much, just about enough to mix them. 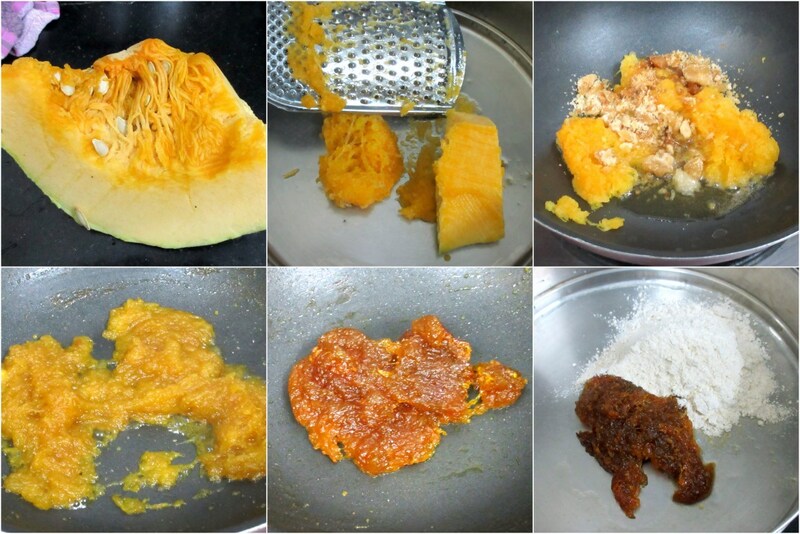 Ideally saute the pumpkin first and when it dries add the jaggery to make pulp. I also added 1/2 tsp of ghee to the pumpkin while cooking. If needed just sprinkle water just enough for the dough to become easy to handle. I missed this month's challenge. Will definitely try to make this some other time. Gharis look yummy!! Poori looks nice n crisp. Thanks for adding me to ICC.